If you've ever hosted a holiday party, you know the amount of planning, effort, and commitment it takes. 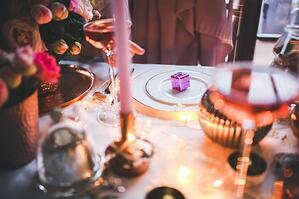 All too often, hosts and hostesses take on the full responsibility of a private dinner party. The number of tasks required before, during, and after an event can fill a long list. While it can be tempting to follow a DIY approach, there are many benefits to skipping the workload and working with a professional. But behind every successful private party, there's an individual or a group putting in a lot of effort to create a fun atmosphere for the guests. Think about your reasons for holding a holiday party. In today's busy world, just getting everyone together is an accomplishment - whether it's a group of friends or your whole family. In those rare moments when the entire group is together, do you want to be stuck behind a stove, or do you want to be enjoying time with your loved ones? As a chef and caterer, people are always sharing their culinary adventures and experiences with me. When I speak with someone about their reasons for wanting to have their next private party catered, there are a few that come up in nearly every conversation. If you're concerned or stressed about having to "do it all" this holiday season, trust me, you're not alone. Here are the top five reasons people choose a private party catering company for holiday parties. Imagine if menu planning could be focused on what your guests will enjoy, instead of what you know you can prepare. Working with a professional chef means you'll have someone bringing their expertise to the table. You'll be able to consider options to delight your guests without worrying about preparing the meal. Caterers will know how to time each dish and ensure everything comes out in pristine condition. Caterers have years of experience organizing, planning, and hosting private parties. They will go out of their way to offer you the best. Caterers keep up with seasonal offerings and the latest trends. They can cater for vegetarians, vegans, kosher, gluten-free, non-GMO, and even children's meals. As the host, you can ensure any guests with dietary restrictions can fully enjoy their meal. As you already know, organizing, planning and hosting a private event all on your own can take a huge toll. With private caterers, things become much simpler. They know exactly how to shop for the menu, and they have the right equipment to expertly prepare the food. If you've ever been in the middle of preparing a meal just to realize you don't have one of the ingredients or tools you need, you understand how valuable it is to be prepared. Private party caterers also employ well-trained, skilled, and experienced staff members who work as a team to ensure the meal meets and exceeds standards. Professional caterers do this sort of thing all year round - they know how to pull off a holiday meal. They're experienced in the planning and execution, and they know how to listen to your needs and concerns. When you work with a professional catering service, the full weight of the party is no longer on your shoulders. Instead, hiring a professional will ensure your event is more successful. A professional catering company is reliable. They won't cancel on you at the last minute - they know their name and reputation is on the line. As experienced hosts and hostesses know, the responsibilities don't end when the last guest leaves. Instead, it's the beginning of scrubbing dishes, wiping down surfaces, and cleaning up after spills. A typical holiday party isn't a one-pot wonder - it's a multi-course offering. When you have private party catering, nearly all of those dirty dishes go right out the door when the cater leaves. The biggest complaint I hear about the DIY approach to hosting a holiday party is that the host or hostess isn't able to enjoy any of the fruits of their labor. They spend days - sometimes weeks - planning and preparing for the big day. Then, they spend all day creating a beautiful meal for their guests. In all that responsibility, when do you get to enjoy yourself? You deserve to experience your party along with your guests. Plus, you're guests came to your party because they want to celebrate with you. If you offer a catered meal during a private holiday party, you'll look back on the day and remember how much fun you had instead of how hard you worked.